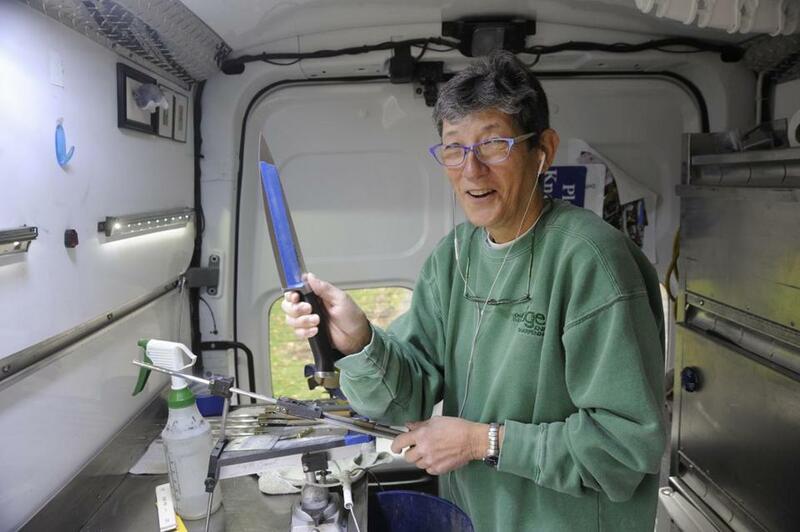 Patti Small at work in On the Edge Knife Sharpening’s van. She travels year-round to farmers market and special events, specializing in hand-sharpening whatever needs attention, from serrated, straight edge, and Japanese kitchen knives to gardening shears, pet grooming scissors, and other tools. Prices range from $6 for knives under 6 inches to $22 for paper-cutter blades. Her own tools consist of a whetstone, ceramics, and various polishing stones. Q. Any job in the film industry sounds glamorous. Why did you want to leave it? A. Traveling is exciting when you’re 30, but not when you’re over 50. I was living in hotels and decided this is not how I want to spend the last part of my life. Q. How did you come up with knife sharpening as your new career? A. I tried carving pumpkins, which you can see on my website. I made urns for pet ashes out of really nice wood, but China can make them cheaper. Then I realized I didn’t know where to get my knives sharpened, and if I have this problem, other people have it, too. So I taught myself. Q. Knives become dull so gradually. When do you know it’s time to sharpen one? A. Get a tomato and see if the knife will cut through the skin without mashing it. If it pushes the skin in, it’s not OK.
Q. What do you think about the claims that a particular knife never needs sharpening? A. I’ve yet to see the knife that hasn’t needed to be sharpened. On the other hand, I’ve seen plenty of disasters where the metal isn’t very good and they should just be thrown away. There are good knives for every budget. Q. Are you ever tempted to switch to faster machine sharpening? A. I’m 60 and I have arthritis, so I shouldn’t do it by hand, but I love it. Hand-sharpening is an art form. It’s like Zen meditation. Small’s calendar includes a stop at Verrill Farm, 11 Wheeler Road in Concord, on Dec. 13 from 9 a.m. to 2 p.m. For other dates or more details, call 857-205-7928 or visit www.onthe-edgeknifesharpening.com.